Home » squirrel proof bird feeder tips » Any new squirrel proof bird feeders out there? Any new squirrel proof bird feeders out there? "Yes, we're doing fine... as long as you hate reading long articles here!" 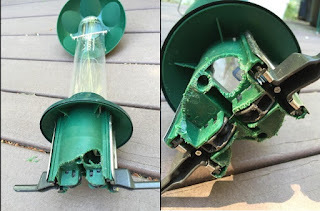 It's been almost two years now since I've wrote last squirrel proof bird feeder review here and it's because no new feeders showed up in the meantime. Well, at least not the ones worth of your attention. Really, "there is nothing new under the sun". This means that even after these two years Droll Yankee is still world's best spinning anti-squirrel bird feeder, while Wild Bill is still the best electric squirrel shocker of all times. Unfortunately, the people are still too busy to read long articles like how to choose best squirrel proof feeder before actually buying one. That's how shopping mistakes are usually inevitable. 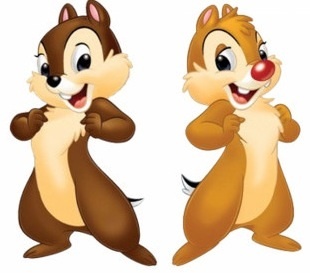 Of course, Chip and Dale love that! Beware and be aware of cheep feeder copies! Feeder got eaten by squirrels. This is what's left from this very unfortunate "squirrel proof" bird feeder after becoming squirrel food. No, am not going to tell you the name of the feeder because it is against the rules of this website, but I will tell you it is cheapo copy of otherwise real good veteran feeder Brome Squirrel Buster Plus. This feeder is on the market till recent and sadly enough, it is soaring with sales. So maybe it is time to start reading long articles, right?